For Temperature Calibration Click Here! View a PDF of our certificate by clicking here. ETI's humidity laboratory is equipped with one of the world's premier humidity chambers together with a high accuracy mirror hygrometer. The Thunder Scientific 2500 humidity chamber uses two-pressure technology to generate controlled humidity conditions, which has long been the recognised standard for instrument calibration, test and verification. This method of generation is a fundamental technology, enabling confidence in traceability to National Standards. This, combined with an NPL referenced mirror hygrometer, ensures the standard of calibration is to a very high level. If you then combine this with UKAS Accreditation, and a rapid turnaround of your instrument, you can be sure that the service offered by ETI's humidity laboratory will meet your requirements. Accurate monitoring of humidity can increase the efficiency of productivity in many aspects of production. An increasing number of employers are also realising the importance of healthy working environments, which includes the control of humidity to help prevent airborne bacteria, eliminate static shocks and reduce eye-strain. 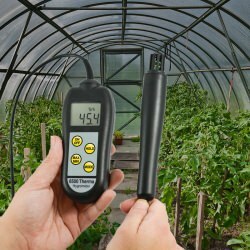 As with most digital equipment, but even more so with hygrometers, there is a tendency for drift over a period of use. Therefore a regular calibration by comparison against Standards, traceable to National Standards, provides confidence in the continued accuracy of your instrument. 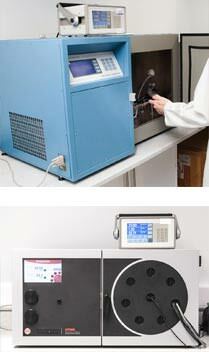 ETI's humidity laboratory is also UKAS accredited for air temperature measurement certification. Please see below for best measurement capability. For humidity calibration prices and procedure and to obtain a pre-order quotation please click here.